What Happened? Exciting news for this LDS Game! There's been a lot happening in this little card game's world lately! It's all very exciting, and a lot of work. First of all, we've been rebranding. 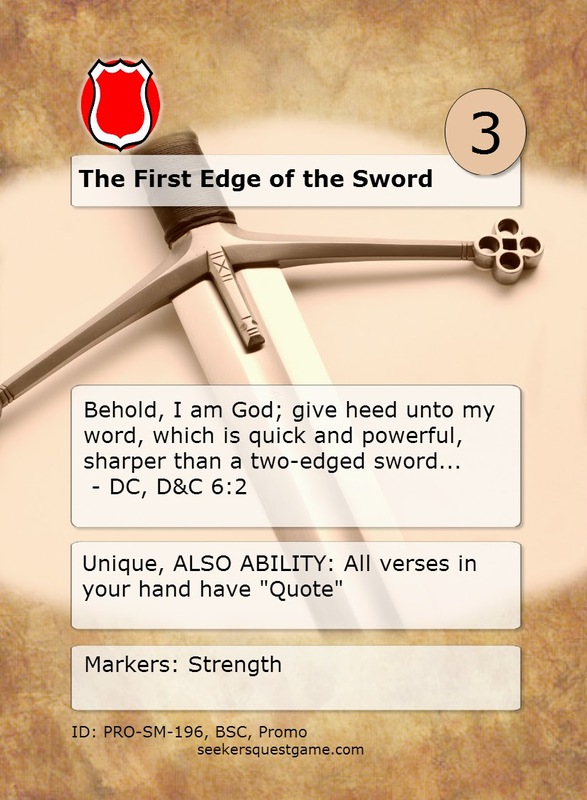 It turns out that there's another scripture based game on the market already that got published using the name Chapter and Verse. It actually looks like a pretty cool game. While it's been a challenge to rebrand, it's a good thing for us, too. My use of the Chapter and Verse name was always a "place holder", and I was never certain I wanted to use the name in publication. Now, we brainstormed, researched, and have chosen the name "Seeker's Quest". In addition to having a more enticing, exciting sound, it also ties in better with the game's theme and backstory, as well as connecting strongly with advanced achievement gameplay. I've also been preparing the graphic look and feel of the game, setting up prototype logos, icons, and cards. That's been very time consuming, as it's difficult to find royalty-free graphics for almost 200 cards! Still, I've been very pleased with the results so far. Most of this is being shared and posted over at the new Facebook page, at https://www.facebook.com/seekersquestgame. I hope you'll join the fun over there, for regular posts and updates as the new cards get ready for publication!